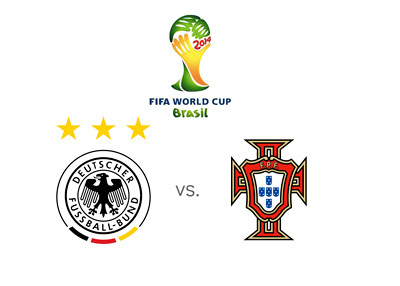 The first game in Group G of the 2014 FIFA World Cup is a battle between Germany and Portugal at the Arena Fonte Nova in Salvador on Monday, June 16th, 2014. Germany are a serious contender in this tournament. With Manuel Neuer on goal and Mesut Ozil & Mario Gotze pulling the strings in midfield, this team means business. In the qualifications, Germany came out unscratched from Group C, which also featured Sweden, Austria, Republic of Ireland, Kazakhstan and Faroe Islands. One interesting thing about this German team is that they still have the thirty six year old, 2006 Golden Boot winner, Miroslav Klose, as their main striker. Portugal earned their spot in the World Cup through qualification playoffs where they beat Sweden, after finishing second in Group F behind Russia and ahead of Israel, Azerbaijan, Northern Ireland and Luxembourg. Portugal are a solid team which features three Real Madrid stars: Cristiano Ronaldo, Fabio Coentrao and Pepe, among others. Germany are the big favourites to win this match according to the odds. Germany are also one of the favorites to win the World Cup, behind Brazil and Argentina. Will Philipp Lahm and his teammates be able to dominate this match as most suspect, or will it be Cristiano Ronaldo and Helder Postiga lighting up the stage on Monday? It should be a great game. Miroslav Klose needs two goals to become the World Cup's all time record scorer.